Our motorcycle rearsets are made of lightweight super strong billet aircraft aluminum, and precision machined using 3D CNC mills. We produce fully adjustable rearsets for Suzuki, Yamaha, Kawasaki and Honda motorcycles. See our wide range of motorcycle lowering kits for Honda, Suzuki, Kawasaki, Yamaha, Aprilia, BMW, Hyosung, MV Agusta and Triumph motorcycles. Now you can lower the seat height of your Honda, Kawasaki, Suzuki, Yamaha, Aprilia, BMW, Hyosung or Triumph motorcycle to fit your needs. For most bikes we have lowering kits for various lowering of the rear suspension. See our range of motorcycle suspension jack up kits rising the ride height of your motorcycle. Jack up kits available for Aprilia, BMW, Cagiva, Honda, Hyosung, Kawasaki, Suzuki, Yamaha and Triumph motorcycles. Like to raise the rear suspension of your bike? See our range of rear suspension rising kits. 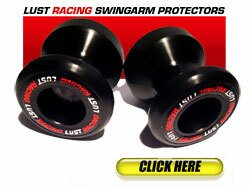 Lust Racing manufactures motorcycle high quality crash protectors. Crash protectors are also known as engine protectors, frame sliders, crash bobbins, crash mushrooms and fairing protectors. Lust Racing crash protectors are available for Honda, Suzuki, Kawasaki, Yamaha and Triumph models. 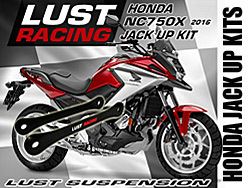 Motorcycle accessories by Lust Racing, we produce adjustable rearsets, suspension lowering and rising kits and crash protectors for popular Japanese motorcycles like Suzuki GSXR 600, 750, 1000 series,Suzuki Bandit 600/1200, V-strom DL650/DL, SV650,GSR600, Yamaha YZF R1, R6 (YZF-R6),FZ1, FZ6, Kawasaki Ninja ZX6R, ZX9R, ZX10R, ZX12R Z750 and Z1000 and Honda CBR600RR, CBR900RR, CBR929,CBR954,CBR1000RR, Fireblade,CBR1100XX Blackbird, VFR750/VFR800 and more. Lust Racing is continuously expanding our product range, if you do not find the product you are looking for please let us know! You can also sign-up for our quarterly newsletter to get announcements of new products and special offers. Lust Racing is dedicated to customer service, our aim is to produce high quality motorcycle accessories to motorcycle enthusiasts worldwide. Ride height adjuster kits for lowering or rising the rear suspension of your motorcycle. Replacing the suspension linkage provides the possibility to set up the suspension to suit the the racing track, track conditions and riding style. A must have for racing and track day use, highly popular for road use, streetfighters and stunt bikes. Easy to install with basic hand tools. Crash protectors by Lust Racing. We manufacture heave-duty crash protectors mounted to the front engine mountings on the frame. Extremely high quality. Lust Racing produces also fairing protectors for some models or "small bungs" protecting the bike further, small protectors are fitted at fairing fixing points. Fitting faring protectors may lower your insurance premium. Check with your insurance provider. Read more about our motorcycle accessories. We send orders world wide on daily basis. All orders are sent with tracking code to ensure your order does not get lost. We dispatch orders every weekday Monday to Friday. Orders placed during the weekends will be dispatched the following Monday. WE HAVE ALL PRODUCTS IN STOCK unless otherwise stated. 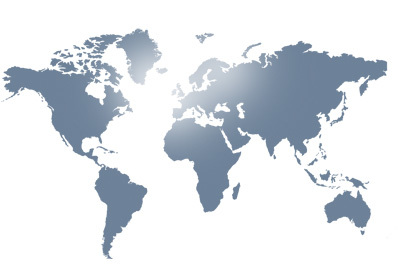 Estimated delivery times: UK 1-2 business days "RoyalMail 1st Class Signed for", Europe "EU" 3-5 business days depending on country "RoyalMail International Signed for", Rest of the World "non-EU": USA, Canada, Australia, New Zealand, South Africa, Japan, Mexico, Brazil etc. 7-14 business days. At additional cost we can send UPS, FedEx, DHL or other carriers, please contact us for quote. At Lust Racing products we take pride in manufacturing motorcycle accessories of absolute top quality using hi-tech manufacturing methods and the very best materials available. Lust Racing products are design, engineered and manufactured to exact tolerances and dimensioned to last the lifetime of your bike. Our products are supplied complete with installation instructions. Should you have any questions please contact our customer service using the contact form found on our site. Payments on our website are handled over a SSL (Secure Socket Layer) payment gateway. Your personal and credit card details are encrypted during the transaction and CANNOT be read by anyone else. We do further never store any credit card details. We offer PayPal and Credit Card payment options on our site. Should you of any reason not want to pay online, contact us for alternative payment methods. We ship motorcycle accessories worldwide to motorcycle racing teams, workshops and motorcycle owners. motorcycle accessories. LR.Lust Racing.